This article appeared in Playthings on September 8, 2008. LAS VEGAS—On the first day of this year’s ABC Kids Expo tradeshow, the Juvenile Products Manufacturers Association today revealed the 10 winners of its annual Innovation Awards Competition. More than 100 products were entered, and 10 winners were selected, according to JPMA. The products were evaluated by a selection committee of trade media representatives and industry retail buyers, and judged on their innovation, marketability, trend-setting potential, appeal and usefulness. Zigo Leader Carrier Bicycle, Zigo Leader’s Zigo Leader Carrier Bicycle (pictured), a combination bicycle and jogging stroller that can be ridden as one unit with the ChildPod child carrier in the front, or separated for use as either a bicycle or as a baby jogger separately. 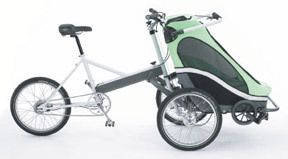 The ChildPod can also be used like a traditional bicycle trailer. Baby Planet’s Eden Convertible Bassinet, a bassinet that “combines bold styling with expanded features to go far beyond any other bassinet,” according to JPMA. Like the Zigo Leader, it’s a dual-use device, having the ability to double as a toddler chair. Other features include “Easy Release” hand grips to detach from the base, soothing music and vibration, easily accessible storage and a removable, machine washable liner. Medela’s Freestyle Breast Pump, a rechargeable, hands-free, double-electric breast pump. It weighs less than 1lb. and hands-free accessories attach easily to nursing bras and the motor can be worn on the waist, or placed on mom’s lap or a table. Teutonia’s Teutonia Stroller features a modular design that allows for customization to suit individual lifestyles and needs. It can be customized in-store with three seating options, including like the t-Tario 32 car seat; two wheel options and three stroller chassis for different phases, stages and uses. Every seat snaps into every stroller chassis so they’re easy to change as children grow or parents’ needs change. Wishbone Design’s Wishbone Bike is 3-in-1 ride-on toy. Without pedals, it begins at age 1 as a lightweight and stable trike; converts to a bike that teaches 2 and 3 year olds to balance on two wheels without trainers, then the frame flips over to grow with children up to 5 years old. It’s eco-friendly, having been made from sustainable-harvested birch wood, recycled plastic wheels, and non-toxic, eco-friendly glues and finishes. TheLindsay Loo Co.’s Bibbies 4 Babies are bibs that attach to baby’s clothing using rare earth magnets in order to elimination traditional straps, Velcro or snaps. The bibs are soak- proof, reversible, machine washable and dryer safe, according to their manufacturer. Stroll-Air Handle sleeves are Neoprene stroller handle covers offered in three sizes (9 inch, 12 inch and 24 inch) that can be mounted on most strollers on the market. Handle sleeves can also be used on strollers’ bumper bars and shopping cart handles. Full zipper allows the sleeve to be easily attached and removed for washing. Scandinavian Child’s Beaba BabyCook is a patented, compact countertop appliance that functions as a steamer, blender, warmer and defroster. Cardinal Gates’ Lock N Block Sliding Door Gate is a patent pending safety gate specifically for sliding patio doors. 4 Moms’ Mamaroo improves on the bouncy seat and baby swing, providing for controlled lateral motion in two dimensions that mimics the actual soothing movements that mothers make when holding their babies. It plays several soothing songs and has an audio dock so parents can personalize the audio experience for their baby.